My search for books by Wendell Minor at the library gave me quite a thrill this week -- yes, I was actually giddy. I found books about space, animals, history, famous americans, and even Halloween! I immediately thought to myself, "It has been too long since I made one of my 'Reading Experiences'." This week I unveil my third "Reading Experience" that features Wendell Minor, many of his great books, and lots of fun activities. Wendell Minor's reputation has him pegged as a hard working illustrator that pays attention to details. In an interview with On Beyond Words and Pictures he said, "I have spent the last four decades working 12-14 hours a day in the studio - reading, writing, researching, sketching, painting, and designing; sometimes 7 days a week." His career began in 1968 by illustrating book jacket covers. He was quite successful creating over 2,000 covers including Harper Lee's To Kill a Mockingbird. It wasn't until 1988 that he illustrated his first children's book, Mojave by Diane Siebert. As I read his books to my children, I appreciated his commitment to making sure his illustrations were historically accurate. In a video from Simon and Schuster about his book Night Flight he said, "My research for Night Flight was extensive. To make it absolutely as accurate as I possibly could, I sent my drawings to experts and pilots to make sure that what I was doing in this book was absolutely as close to historically being correct as possible." (Watch the video below to learn of all the ways he researched the event and the plane -- it is remarkable!). 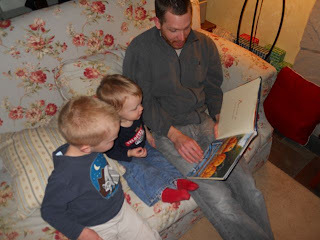 This week my kids and I read a dozen books illustrated by Wendell Minor including Look to the Stars by Buzz Aldrin and Sitting Bull Remembers by Ann Turner. As we read each book, I began compiling ideas to include in the Wendell Minor Reading Experience. Once I had an activity idea for each book I arranged them all on a grid which became the first page of the printable packet. I feel the activity grid is like a road map. A child can look at this page and decide where they want to go with their learning. I have included activities that focus on art, acting, drawing, writing, and much more to appeal to a variety of learners. Since I read only a dozen of his books and he has published over forty, I also left space on the grid to add your own activity for a book of your choosing. My son was attracted to the book, Fire Storm by Jean Craighead George. 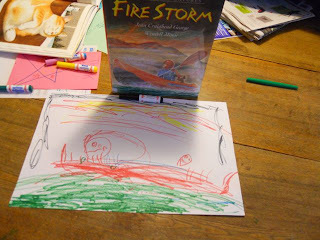 We read the book and then he decided he wanted to try the activity -- "Design a public service poster that explains the dangers of intentionally set wildfires and the benefits of naturally occurring wildfires." He was so excited about his poster that he took his own photo so that it could be featured on the blog. His poster was actually a retelling of the story, but I was impressed. 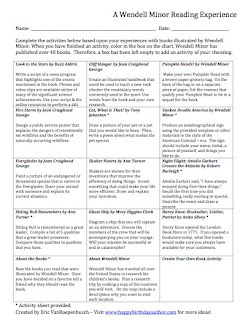 The Wendell Minor Reading Experience also includes the worksheets necessary to complete many of the activities. I hope you enjoy this free resource from Happy Birthday Author. Please pass it on to your fellow homeschooling friends, librarians, or teacher colleagues. Click on the image below to download the packet! It is also available on my Teachers Pay Teachers page as a free download. If you like this Reading Experience, more of my reading experiences are available by clicking on the Lesson Plans tab under the logo banner at the top of this page. My boys and I really enjoyed Pumpkin Heads! by Wendell Minor. Natalie -- I am so glad you downloaded the packet and I hope you are able to use it this summer. What a wonderful resource, Eric! Honestly, I'm so busy reading your blog that I didn't even see the "Lesson Plans" tab. I'm off to check it out right now. We're so lucky that you find time to develop such great tools for school. Kirsten -- I hope you find a few things that are beneficial. I think I need to work on the page a little bit and make it more visually appealing. I shall be passing this on to some teachers at school, Eric,, what a super resource page! Wendell has illustrated such a great breadth of stories! I am well impressed with the depth of research he did on Amelia Earhart! Thanks Joanna! The other reading experiences I have made were used in my wife's school with great success. The kids loved the activities! If the teachers at your school use it, please let me know their thoughts.